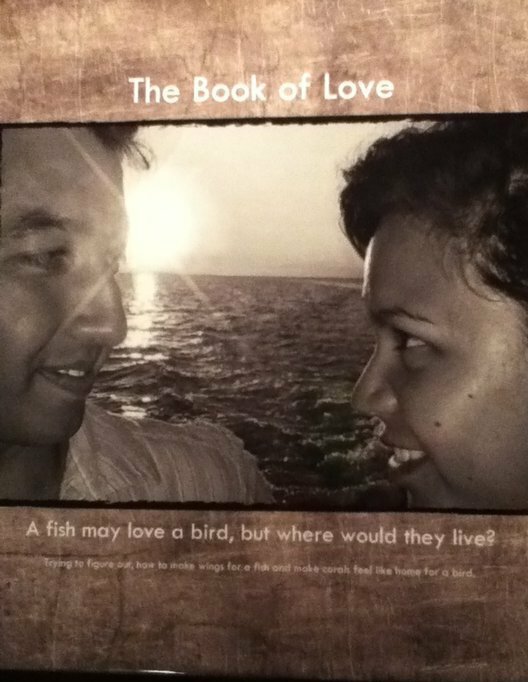 The book of love – volume 1. As I read through my very own copy of the book of love yesterday, I couldn’t help it and started to sing Peter Gabriel’s version of this song. I turned 23 only a few days ago and although I am birthday-crazy, there was a sense of sadness when I woke up that day. It was quite rough to get up that day, mainly because it was yet another birthday that I didn’t get to spend with A. However A – as usually very caring and thoughtful – send me a birthday present only a few days prior to my birthday. I couldn’t wait to open it. I had no idea what I would find in the package since A’s presents are always unusual and always very special. There is nothing fancy or uber expensive about A’s gifts nor does he ever ask me what I do wish for. So I never know what to expect. Let me tell you though, I have never been disappointed. Happily surprised, flabbergasted, close to tears? Yes, definitely. Every single time he gives me a present. So when I unwrapped my present this year I was about 98% excited and 2% sad (or was it the other way around? I can’t remember…). A was watching me opening the box (thank you skype btw) and I could feel how he too got more and more excited with every attempt of me trying to open the present (it took me about 15 minutes to do so). And when I finally opened it, I could hardly hold back my tears. In my hands I held my very own version of our book of love – volume 1 (you know what that means: many more to come), A put so much effort in the writing and in picking out the pictures and making the book just wonderful for me and I read in it every single night, because it makes me incredibly happy, that I found someone who is willing to write our story together. I love J for so many reasons. Love also isn’t even the proper expression, because it doesn’t encompass the respect, loyalty, and appreciation that I have for her. Being with J has changed my life, and now as I’m searching for words to describe this closeness I can’t come up with a single one. Maybe cloverespadmiration something like that gets close. Maybe it’s simply beyond words, maybe it’s chemical or maybe miracle. Who knows? For someone rooted in practicality and someone determined to be scientific, it is difficult to describe without sounding like a greeting card. I just can’t imagine a life without J. It simply doesn’t add up. I’ve tried to imagine what it would be like, but the minute I start thinking about it, my mind draws a blank. So maybe that’s the truest test. It’s not because I can imagine a day that J and I are together, but because even if I tried, I can’t come up with a life without her. I guess A and I are ready for volume 2 of our lives.